Animal studies get rubbished all the time and one thing that gets peoples backs up is the failure to translate. It is sad when this happens because of the wasted effort and the dashed hopes. As soon as a trial fails however, the community view is often very blinkered and it gets the idea that this or that drug is no good and the mud sticks. Therefore, animal studies take another bashing. However, we do not do enough “trial bashing”. I am convinced that many a good idea of scientists has been canned because of a ineffective trial design or it’s implementation. Yes I hear some people say “we best not say anything in public about the neuros because they are “simply the best””. http://multiple-sclerosis-research.blogspot.com/2015/10/a-fairy-with-dimmer-or-beacon-of-light.html but that was in the old days before we were punished for bad behaviour by ProfG. It is not good form to say they have failed…failed in the trial, failed you their patients and failed the scientific community. The anterior visual system presents several advantages for testing neuroprotection because the effects of treatment on its structure and function can be measured with increasingly sensitive noninvasive techniques including optic nerve MRI, optical coherence tomography and visual evoked potentials. Several recent optic neuritis trials have tested the neuroprotective potential of drugs such as erythropoietin, and inhibitors of voltage gated sodium channels, glutamate receptors, and acid-sensing ion channels. Proof of concept of neuroprotection, indicated by preservation of the retinal nerve fibre layer and/or the area of the optic nerve, has been suggested in trials using phenytoin, memantine and erythropoietin. In the phenytoin trial, treatment from a mean of 8 days after onset of visual loss, and continued for 3 months, prevented 30% of the loss of thickness of the retinal nerve fibre layer, and 34% of the loss of macular volume, when measured after 6 months. Interestingly, preservation of structure in the active arms of these trials has not been associated with a significantly better visual outcome, measured using high and low contrast acuities, suggesting that more effective therapies (or combinations of drugs targeting different mechanisms of injury), and more sensitive structural and visual outcomes, may be required. Some of these issues are being investigated in ongoing work comparing the utility of different visual outcomes, and comparing measurements of the thickness of the retinal nerve fibre layer with the thickness of individual segmented layers of the macula. Recent progress encourages the view that optic neuritis could serve as model for testing therapies which prevent neurodegeneration in acute inflammatory lesions. However, the relevance of the model to neuroprotection in other relapses of MS, and to progressive MS, remains uncertain, and will depend considerably on the extent to which the mechanisms of neuronal injury are shared in these different situations. 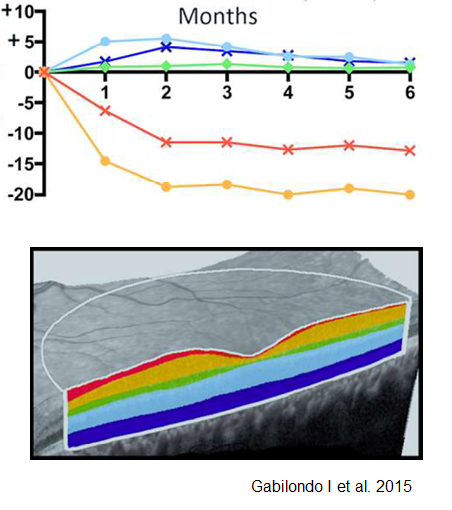 However on the same platform “amiloride (an acid sensing ion channel) does not protect retinal nerve fibre layer thickness following acute optic neuritis; result from a phase II, double blind, randomised controlled trialJ.B. McKee, Headington, United Kingdom. Basic science and early clinical trial evidence suggest amiloride may exert a neuroprotective effect in Multiple Sclerosis (MS) through blockade of the acid sensing ion channel (ASIC). Optic neuritis (ON) is a discrete CNS inflammatory event leading to neuro-axonal injury. The extent of neuro-axonal injury can be assessed by the thickness of the retinal nerve fibre layer (RNFL) by scanning laser polarimetry (GDx) and optical coherence tomography (OCT). Thus, we examined the neuroprotective efficacy of amiloride in acute ON in a phase II, double blind, randomised controlled trial utilising GDx and OCT (NCT01802489). Participants aged 18-55 years were recruited within 28 days of onset with a first episode of unilateral ON including patients with MS, providing diagnosis was within 10 years and EDSS < 3.0. They were randomised to amiloride 10mg/day or placebo for 5 months. Exclusion criteria included diabetes, raised potassium, or disease modifying therapy except β-interferon or glatiramer acetate. All study procedures were conducted at the John Radcliffe Hospital Oxford, UK. Primary outcome measure was the difference between amiloride and placebo groups in the GDx derived affected eye RNFL thickness at 6 months compared to baseline in the unaffected eye. Secondary outcome measures included; OCT derived RNFL thickness at 6 months, and by both modalities at 12 months, visually evoked potentials (VEP), pattern electro-retinogram, high and low contrast visual acuity, Humphrey visual field and Farnsworth Munswell 100 hue colour vision scores. 48 patients were recruited. 3 withdrew due to alternative diagnosis, 1 withdrew consent and 1 was lost to follow up, leaving an ITT cohort of 43 patients; 23 placebo, and 20 amiloride. There were no significant drug related adverse events. No significant differences were found between groups in the primary outcome measure (p=0.84) and no significant difference in visual measures at 6 or 12 months. VEPs were significantly prolonged in the amiloride group compared to placebo (p=0.004). In summary, our trial failed to show any neuroprotective benefit of amiloride in clinical and surrogate measures within acute ON. So is this the end of amiloride…..not quite yet because it is being testing in MS-SMART still, but in many peoples eyes this is a failure in the idea and in the supporting animal data. On the otherside Phenytonin is a success because it saved nerves. The animal data is saved for another day and sodium channel blockers are not kept in the trash can following Dr Kapoors perceived failure of lamotrigine in secondary progressive MS study. (a) Is this important .. I doubt it but one takes 12 months to get the answer when the other only takes 6 months when in fact the answer could probably have been got by 3 months, because the action is all over by then. If you look at a time course study, you will notice that all the action has largely occurred by a month. Therefore the damage is done and if you start too late the damage is done and there is nothing to save. (b) A major difference of the trials is time taken to get people on the drug. In the Amiloride trial the recruitment was up to one month after the symptomatic event (Trial failed), the any Lingo-1 study was up to one month after the event trial (essentially failed although it was remyelination and not neuroprotection). In the phenytonin trial the window was set at two weeks because our animal studies supporting the trial indicated that the drugs would work whilst the inflammation was being generated during blood brain barrier dysfunction. In animals this lasts a few days in humans the MRI studies indicate that lesions enhance for 2 weeks so this is the time set and most people started drug within 7 days. This is most likely to a reason for success over failure in that amiloride was started too late to be of real benefit. We will never know because the trial will not get done again. However has the phenytonin trial succeeded…..well no…because at present there are no plans to confirm the result (which may be required to make people change their practise) and no plans to ensure that this work has any IMPACT by changing clinical practise. As a basic scientist your efforts then flounder as the neuro moves on to their next adventure. Are people with optic neuritis being offered phenytonin? Newly diagnosed…what was your experience? If the answer is no, then why are we doing the trials because the results have no IMPACT on practice? It may provide confidence to do the long-term progressive MS study, but optic neuritis trails may now be seen as a risky business for neuroprotective drugs. I have asked this question of Dr Kappor and it was stated that because sight (visual acquity) was no different in the placebo treatment groups, then it was not justified. However to be fair, the trials were not powered to show an effect and he has calculated that many hundred of people would be needed to show an affect on vision and there was a hit of an effect. However if it is saving 30% more nerves and so prolonging nerve reserve against visual loss in the future would it be worth it? UK Neuros do not feel the pressure of the UK government to produce work with IMPACT…once they do, then maybe they will think what happens after the trial has completed, before they start doing the work. I wish I had the treatment. Acquity isn't everything. Residual damage is common and debilitating. Though the driving standards does not include anything other than acquity lack of discernment of contrast is a real problem. Is there nihilism at play here? All the way up to the decision chain to politicians? Regardless of what you are saying about the politics of it all, thanks. I had a similar rant recently (copy below). Your dejected tone (if I'm reading the tone correctly) made me feel better – misery loves company. My rant was – "So disappointing – here is a study in which a quality of life component would be ideal and so very informative. But no, 'is it worth taking biotin' question has to be approached from the context of (the really useless from my perspective) EDSS. Honestly, I'm so sick of MS landscape and environment lol. It's like Chinese Whispers. You have to guess what the clinical studies are not telling you, you have to guess what your doctors are and are not telling you and no one can compare the efficacy of meds because the pharma don't want to encourage competition. It's really fucked." If you're feeling professionally dejected, I can't even describe how I'm feeling watching someone I love not just go through MS, but the political nightmare of the neuro world. Sometimes I wonder if half the neuros trully believe MS is about them and not their patients, that it's some kind of a power game. Interestingly enough, expressing the pain and the damage neuros have caused (I appreciate this is subjective, but you know so is 'clinical experience' that neuros hide behind) is apparently called 'neuro bashing' and is not good form. If I read your dejected tone correctly (I may not have), that makes the two of us. Cept you go back home at night away from MS and neuros, I don't.